It was modeled following pictures, memories of a sweing hand that twirls strings and lifts them in the air: Ago e Filo is a drawing, brought into reality. 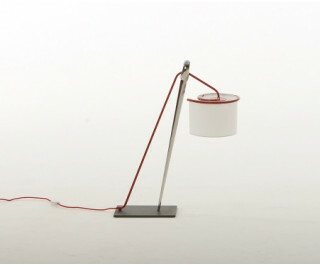 A simple red cable, connecting with its ending path - the cotonette lamp shade - ligthing a room from above, be it with the hanging version, or the free-standing one. Chrome version: red cable; cotonette lamp shade.